Presentation Theatres are an integral part of the World ATM Congress experience. These complimentary forums presented in the heart of the Exhibition Hall provide the opportunity to learn the latest trends and developments from industry leaders. Miss any of the presentations from a previous World ATM Congress? A selection of the presentations are available online. Find them here. 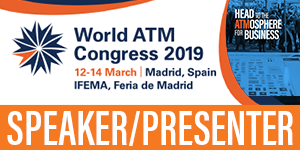 Are you or your organisation presenting at World ATM Congress this year? Please use the following banner on your website and in your email signature line - just add a text description of the time and location of your presentation to promote!